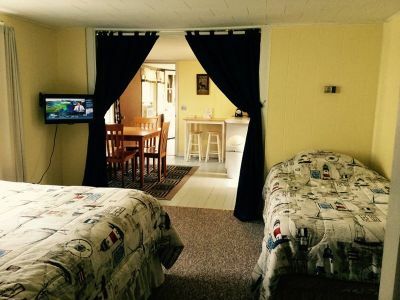 Cottage #1 is our largest cabin with a full kitchen, living room and 2 bedrooms and has a minimum stay requirement. 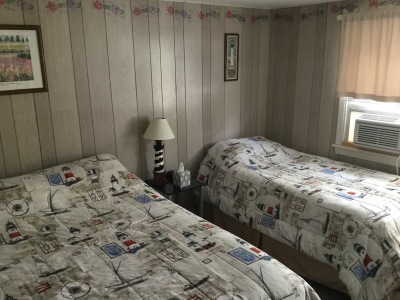 Each bedroom has 1 queen bed and 1 twin bed. 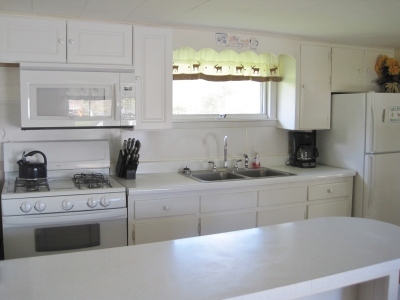 In Cottage 1 the kitchen comes complete with pots, pans, dishes, glasses, microwave, coffeemaker, toaster, blender and kitchen table with chairs. All sheets and towels are provided for your stay. The cottage has a furnace for heat and two window A/C units. Living room includes flat screen TV with DVD player and Wi-Fi. Housekeeping comes in daily to replace towels and empty trash. Guests are responsible for items used in the kitchen such as dishwashing detergent, coffee, paper towels, etc. Outside you have a picnic table and your own personal gas grill. Full bathroom with tub/shower, hairdryer, located between the two bedrooms in hallway. Minimum stay of 4 nights are required from June through Sept, May & October requires a 3 night stay. On occasion smaller stays may be offered to fill in reservation gaps. There is only space for 1 car per cottage. Please note our facility cannot handle trailers, we do not have extra parking available due to our small size. We require a 2 week cancellation policy for this cottage. A 50% deposit is due upon reservation. You may cancel up to 2 weeks in advance and receive a full refund minus a $25 process fee. If canceled inside 2 weeks of your stay you will be responsible for the full stay and only receive a refund (-$25) if we are able to rebook your days.